Take the effort out of investing by making it automatic every time you spend. 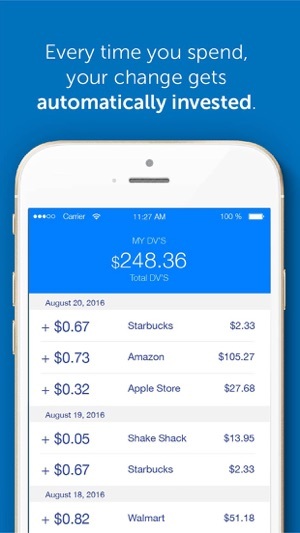 The free Dvdendo mobile app helps you invest your extra change with every purchase, so investing is as easy as spending. With Dvdendo, you can own a piece of the world's greatest companies with just $5. 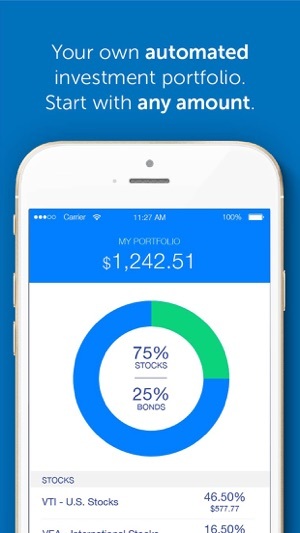 Full service, automated investing for $1 per month. Start with any amount and be fully invested with as little as $5. 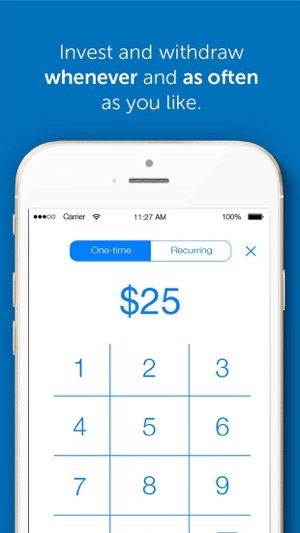 Open your account with your smartphone in less than 5 minutes. Our investment team is made up of experts with multiple decades of experience managing portfolios at some of the world’s largest financial institutions, including Franklin Templeton, Merrill Lynch, Nomura, and XP Securities. 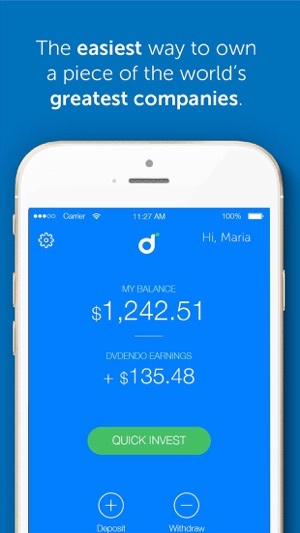 Dvdendo charges a monthly membership fee of $1 for accounts with less than $5,000. For accounts with a balance of $5,000 or more you will only pay a simple 0.35% annual advisory fee which will be deducted proportionally on a monthly basis. 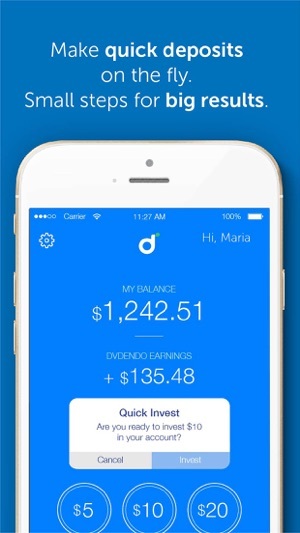 To become an investor and Dvdendo member, sign up from your smartphone, link your bank account and the debit or credit card you use most frequently, and then sit back as our service automatically invests a small portion of your daily expenditures in a portfolio of thousands of stocks and bonds. Security is as important to us as it is to you. That’s why we’ve taken every step possible to ensure the privacy of your personal and financial information as well as the integrity of the assets held in your name. All Dvdendo accounts are insured by the SIPC up to $500,000 in the case of fraud. Even if something happens to Dvdendo, your securities are safe. Our website is secured with 256-bit encryption, the strongest industry standard specification. Your personal information is encrypted and stored behind firewalls in secure servers that are continuously safeguarded. We will never share your data with any third party without your permission. We verify account ownership to ensure that your funds are secure and that any electronically linked checking account belongs to you. Dvdendo is a registered investment advisor with the SEC (Securities and Exchange and Commission). Dvdendo, Inc. (also referred to as “Dvdendo”) is an investment adviser registered with the Securities Exchange Commission. Dvdendo’s advisory services are offered in conjunction with customer initiated brokerage account arrangements with Apex Clearing Corporation (“Apex”). Apex is a FINRA member broker-dealer and member of SIPC. Securities in your account are protected up to $500,000. (See www.sipc.org for more details.) Before investing, consider your investment objectives and Dvdendo's charges and expenses. Past performance is no guarantee of future results. Any historical returns, expected returns, or probability projections may not reflect actual future performance. All securities involve risk and may result in loss. Investments are not FDIC insured and have no bank guarantee. Not an offer, solicitation of an offer, or advice to buy or sell securities in jurisdictions where Dvdendo is not registered. Securities products are conducted through Apex and advisory services are offered by Dvdendo. Apex and Dvdendo are not affiliated entities. Thanks for using Dvdendo! To make our app better for you, we bring updates to the App Store regularly. Every update of our Dvdendo app includes improvements for speed and reliability. As new features become available, we’ll highlight those for you in the app. I downloaded the Dvdendo app pretty early on as the concept seemed interesting. I started with just $20 and quickly saw it growing. I’ve invested more over time and have made 10% so far! Much more than my savings account. The app is easy to use, and customer service has always been responsive when I have questions. The cofounders are really personable and you can see how much they care about their customers and products + believe in it. It makes me believe in it too! Easy way to start investing, highly recommend! At the beginning all was great the app taking money out of my bank account. After months I see the money in the app was around 100 dollars, I decide to refund that money to my bank to use it to buy thing, the app day will take 5-10 days. After 2 weeks the money is not at my bank still. So is crab of the app returning money to use it !!! I withdrawal more than $100 I think it’s been like a month now. And I still don’t haven it in my bank account. I keep sending mails and all they tell me it takes 7 to 10 business days to transfer the money, when I been waiting for that money for about a month now. I honestly just want my money back and that’s all. It’ll be extremely helpful if someone can help me. Thank you.